When it comes to car maintenance, it seems that tire replacement is one of the most things that car owners always take for granted. It’s quite understandable, since car tires are not cheap, and oftentimes confusing. On the other hand, keep in mind that this component is responsible for keeping your ride comfortable, efficient and safe. Not to mention, these rubber donuts carry all the load of your car, as it is the only part your vehicle that has direct contact to the surface. More so, regardless of its condition, you must also keep in mind of if the set of tires installed in your wheels are appropriate enough to withstand your driving habits as well as the riding limitations in your area. Flagrant disregard for this could cause under-performance, serious damage to your ride or worse, road accident. Hence, one cardinal rule in owning a car is to know when and under what circumstances should you need to put your service jack to use and replace your tires. There are few obvious indications that your tires have served its time. One of which is when the tread has already reached its depth threshold (1.16mm). For newer tires, a built-in tread wear bars are installed between the tread’s gap to determine if the tires are already worn out. These grooves are designed to deter water from the tires to avoid hydroplaning/slipping. So if the threads of your tires are starting to “level” then, it means immediate replacement is needed. Moreover, spotting blisters and cracks on the tires sidewall is another indication that you’re in dire need of a replacement. Reaching this point could be crucial to your ride, as you may experience tire blowout while on the road. As a preventive measure, replace the tire as soon as possible, and for your sake, never attempt drive a car with a set of blistered tires. Tires have an estimated lifespan, just like any other things. Distance-wise, a typical tire can keep up for as long as 100,000 miles. Meanwhile, in terms of longevity –regardless if the tires are in use or not – manufacturers usually impose a good 6 to 10 years of tire lifespan. Whichever comes first, tire replacement is imminent and should be prioritized. Tires have a direct effect on the performance of your car, including fuel efficiency. Little did some, if not most car owners know that their tires are under-inflated due to leaks, and this could result to higher fuel consumption. Pressured air-deprived tires basically drag your car’s load, the way a sick horse walks with a passenger on it back. The riding experience becomes “heavy” and thus, needs more power. In relation, there are a number of manufacturers that offer tires with better rolling assistance, which lessens the tire’s rolling effort as the vehicle runs, thus minimizing unnecessary energy consumption while riding. If you think your tires are already contributing to your gas expenses, then consider getting a new set. They may all look the same, but tires do have specifications and designs that cater to different driving scenarios and conditions (race tires, slick tires, truck tires, etc.). So if you’re upgrading your car as a simple necessity to a full-scale racer, it is a-must to include a new set of tires. 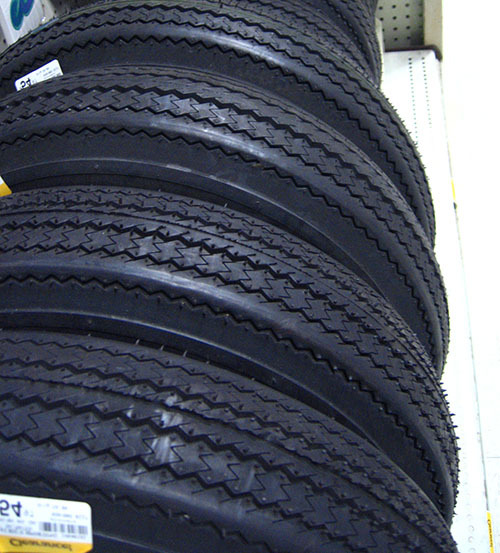 Furthermore, tires differ based on its tread patterns, sizes/profiles and load limitations. If you’re currently situated in an area where asphalt, and even concrete seem to be nonexistent, then you should be watchful of the tires installed in your car. This applies as well for car owners living in season-affected areas, especially winter. A lot of winter-related road accidents are result of slipping and skidding. Better safe than sorry. Grab your trusty hydraulic tools and start changing your tires for the upcoming season. Watch out for more informative automotive and industrial-related posts only here at ABest Industrial Supplies’ official blog page. Want to add something here? Feel free to comment!